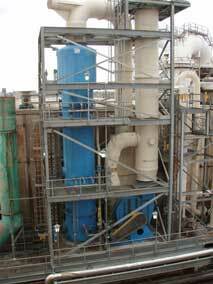 Bionomic Industries, Inc., a leading manufacturer of cutting edge scrubber systems technology, has been selected by a major Southern pulp and paper company to supply their patented, advanced design RotaBed® "Fluidized Bed" Gas Cleaning Technology to control pulp bleach plant emissions at two of their mills. Designed to remove fugitive chlorine and chlorine dioxide created during pulp bleaching, the RotaBed Scrubbing System creates a "fluidized" gas/liquid mixture to clean 15,000,000 cu. ft. per hour of contaminated air at or below all mandated compliance levels. This advanced technology is widely used for gas absorption and cleaning where other designs such as packed towers may plug. It is designed for "clean in place" operation to maximize performance with minimal downtime over its operating life, and runs at over twice the gas velocity of a larger packed tower with a pressure drop of less than 10" water column despite its compact size. It also has one of the lowest maintenance costs in the industry, making it attractive to pulp and paper companies looking for high performance with a superior return on their investment.